This entry was posted in Visual Artist, Painter and tagged Abstract, acrylic paint, Acrylic Painting, CA, Energy, Floral, Flowers, https://www.etsy.com/shop/PamelaAtkinsonArt, Pam Atkinson, Pamela Atkinson, pamelaatkinson.net, pamelaatkinsonart.com, Riverside, Southern California, Teaching Art, Visual Artist on August 24, 2015 by Pamela Atkinson. “The difference between art and science is that science is what we understand well enough to explain to a computer. Art is everything else.” -Donald Knuth, American computer scientist, mathematician, and professor emeritus at Stanford University. This student is in the 7th grade. His compositions are always unusual and well thought out and his brushstrokes create a sense of movement throughout the composition. Parents love the performance, the big game, the recital; it’s a chance to have their child in the spotlight and have bragging rights, too! I love theater, dance, and music and I enjoy seeing children on stage, and all are important components of a well-rounded education. But what about the visual arts? There is rarely applause, but painting, drawing, and sculpture are just as important to the education of a child and to our society as the performing arts. 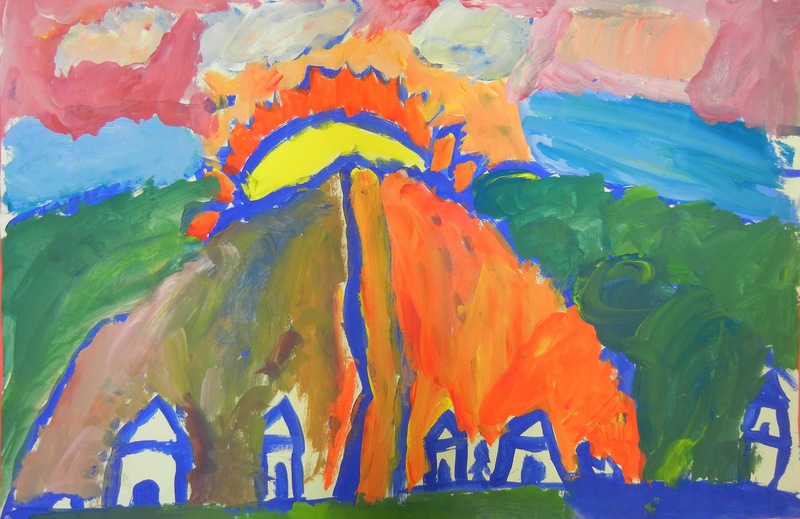 The joy a young child feels when they create an artwork is magnified by the fact that their creation can be shared with their classmates and family. The knowledge that your art can bring joy to others is empowering. It’s an opportunity for a child to have a positive effect on their world. 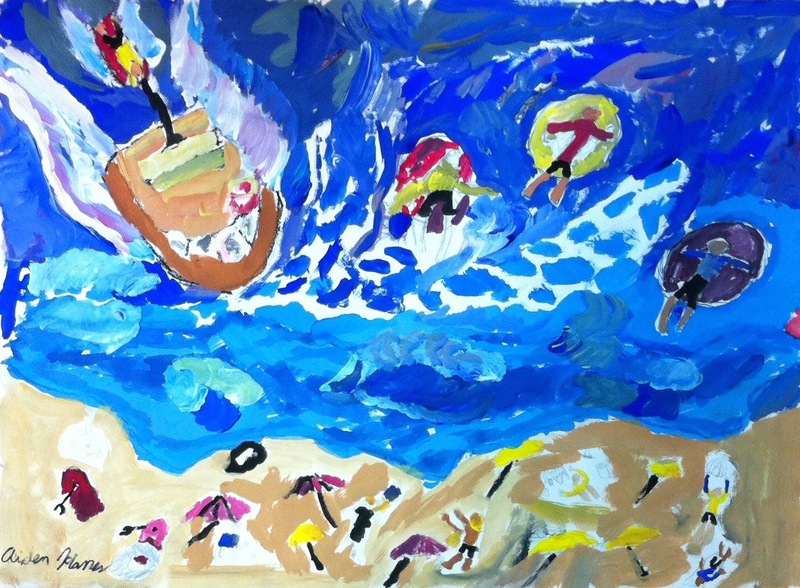 Why should children participate in art class? Creating a painting is personal; the artist can communicate feelings they may have no words to express. Gaining an understanding of their emotions can help a child develop compassion and caring for others and for themselves. These third grade students were given the same instruction and viewed the same examples, but the three paintings are all unique. No two children are alike and their artwork shouldn’t be either. The abilities of their classmates have a strong effect on a child’s sense of worth. Excelling in a subject and being proud of your work is crucial to self-esteem. By focusing only on Science and Math we leave a large percentage of children vulnerable to making false assumptions about their ability to succeed in the world. 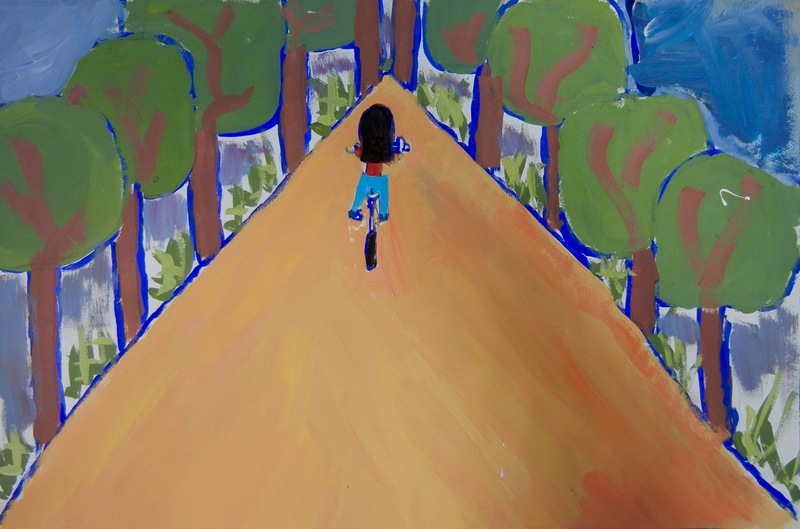 Developing self-discipline and the courage to keep going is something that the visual arts can develop in a child. 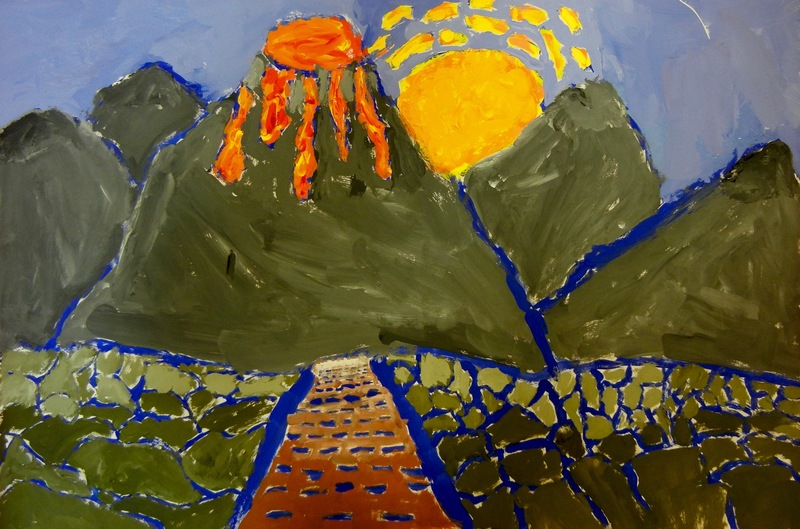 Creating more and more artwork, the student’s skills and understanding of the process of making art develops, as does their ability to communicate their thoughts and ideas. Arts education is crucial if we are to have a society that is literate, able to solve problems, and think creatively. These skills are needed in the rapidly changing 21st century. The procedures used in making an artwork are a mixture of knowledge; some of it technical, acquired experience, and on-the-spot intuition. It’s my belief that everyone can learn to draw, paint, or make a sculpture, but most children are never given the intellectual tools or the opportunity. Creating artwork takes an accumulation of experiments to reach the place where all the elements and principles come together for success. This process should start early and continue through elementary school at the very least. Years of exploring and experimenting will help a child develop an understanding of what it means to be a creative thinker. Practice is important; not everything that’s created will become a finished artwork, but each attempt will be a step in the development of skills and expand the artist’s knowledge. Art can set students on a path that leads to a life of creative thinking, problem solving, and the joy of making and appreciating art. This student is in the 5th grade and she has a well-developed sense of style. All the artwork in this post was created by students from All Saints Carden Academy. 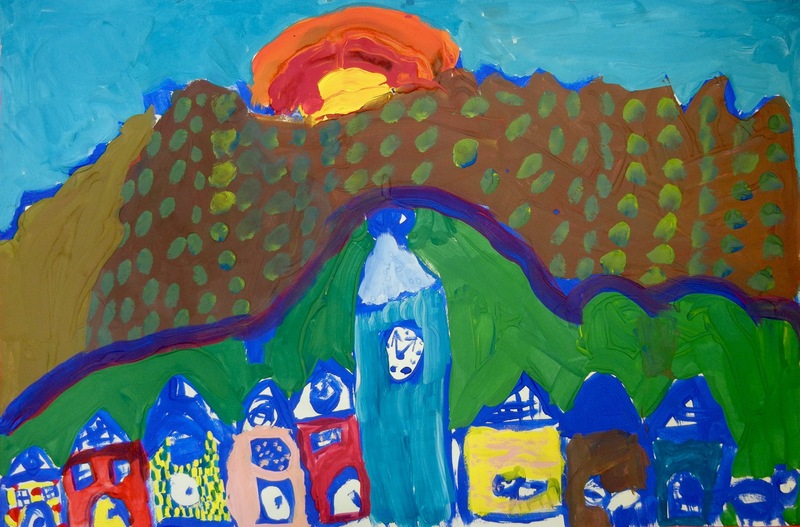 This entry was posted in Visual Artist, Painter and tagged Carden Academy, children, Donald Knuth, importance of arts education, Painting, Visual Arts on April 15, 2015 by Pamela Atkinson. Teaching is an active profession. Filling my time in the classroom is never a problem, I’m always moving from one student to the next; fetching supplies, showing new techniques, and discussing what the kids are creating. Sometimes it’s hectic, but I enjoy my students’ creative enthusiasm. It suits me and contrasts nicely with the quiet time I spend making my artwork. Then there are the private lessons. In the beginning, I had doubts that I could quietly observe and guide only one person. What would I do with all the spare time? It turns out that these hours are some of the happiest of my work week. I’ve gotten to know some wonderful people and share their artistic successes. 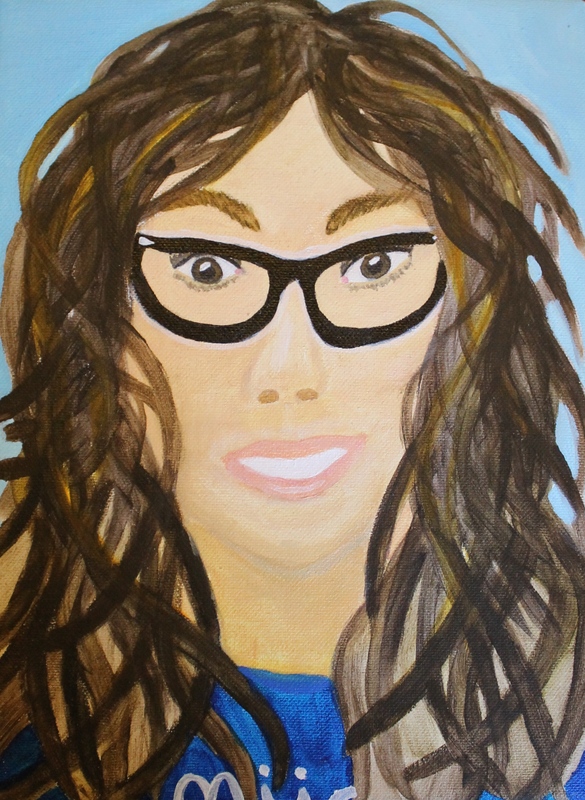 Above is a self-portrait by one of my favorite students. She has just turned thirteen and is smart and creative, and we have an excellent rapport. She challenges me but also respects my advice. We first met when she was nine and I’ve been working with her for a little over three years. She may want a career in art and I want to give her a good start; lots of basic knowledge balanced by her interests and curiosity. 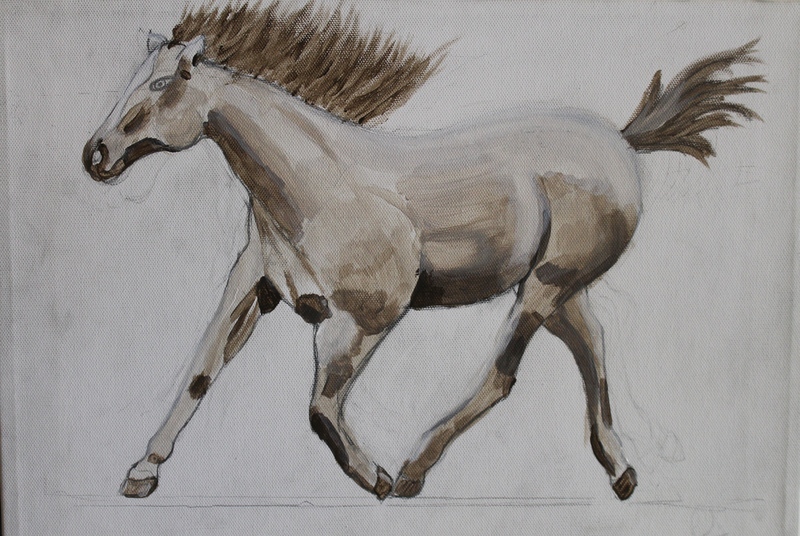 One of the ways we’re marking her progress is that she periodically paints a horse. 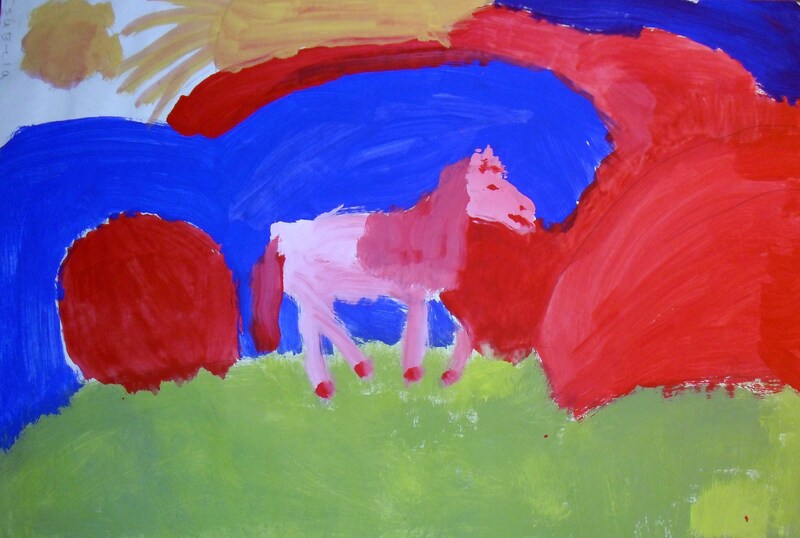 First Horse, painted in the 4th grade. It was one of the first images she painted with me and repeating it was her idea. She’s serious about her artwork and is willing to take time to build a strong portfolio. This first picture, above, is well composed and the pink horse is delightful. For the latest depiction, I wanted her to create a grayscale painting and use glazes to add the color. It’s an old technique, but the understanding gained was worth all her hard work. The finished painting. Glazes of color were applied over the underpainting so that the musculature of the animal shows through the sheer color. Her lastest painting is a watercolor. 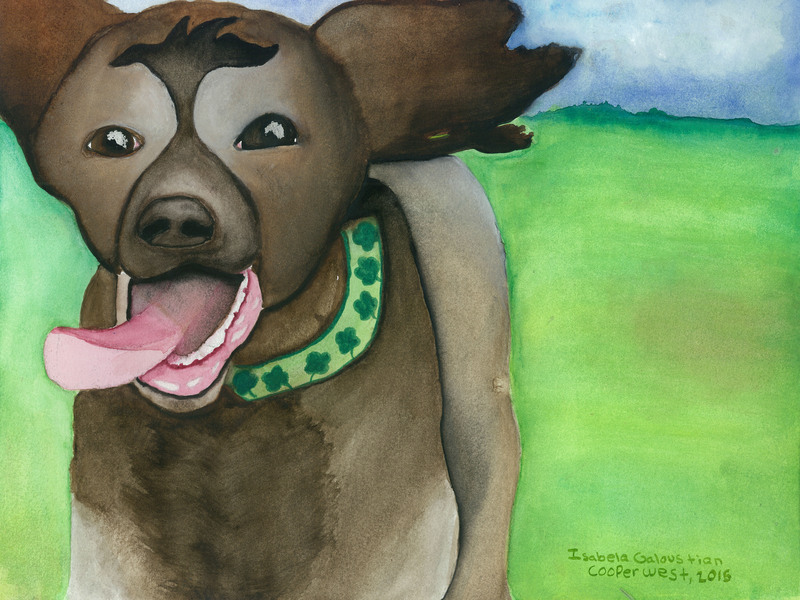 It’s a wonderful tribute to a dog friend who passed away. Much love and care went into making this special work. I’m amazed at how her technical ability has grown over the past three years and I’m looking forward to seeing how her talent evolves. She has the intellect and the drive and her portfolio is off to a good start! 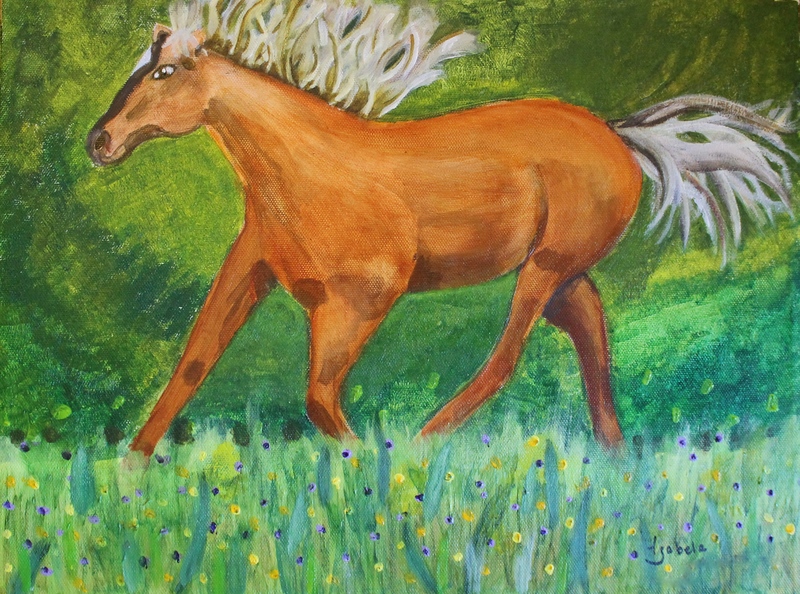 This entry was posted in Painter, Visual Artist and tagged acrylic paint, horses, Private Lessons, self portraits, students on February 19, 2015 by Pamela Atkinson. I enjoy reading Hyperallergic’s A View from the Easel. Artists send in images of their studios along with a written description. I like the messy spaces the best. They make me wonder what’s going on under all the stuff, and I’m envious of the people who have a huge space in which to spread out. It got me to thinking about own my workspace, which I love but have never called a studio. It holds my easel, a large work table with space for my paints, computer, and stacks of miscellaneous items from my current projects, a bookcase, and a smaller table for my watercolors. I share the space with our dog Louie and his toys. The space in front of my easel is his favorite daytime location. It’s a sunny space. I’m grateful for the floor to ceiling windows, except in the summer when it gets too hot. From early morning the light filters into the room and illuminates my easel. I’m addicted to the light and all the shifts and changes it makes throughout the day. I used to paint through the night under bulbs balanced for daylight, I still use them to work on my watercolors, but for my larger paintings there is nothing like sunshine. The light helps to define the colors and show off the many layers of pigment I use to create the forms. In return, when the light begins to dim the mood of the painting shifts and the colors take on a mysterious glow. I’ve always liked working at home. 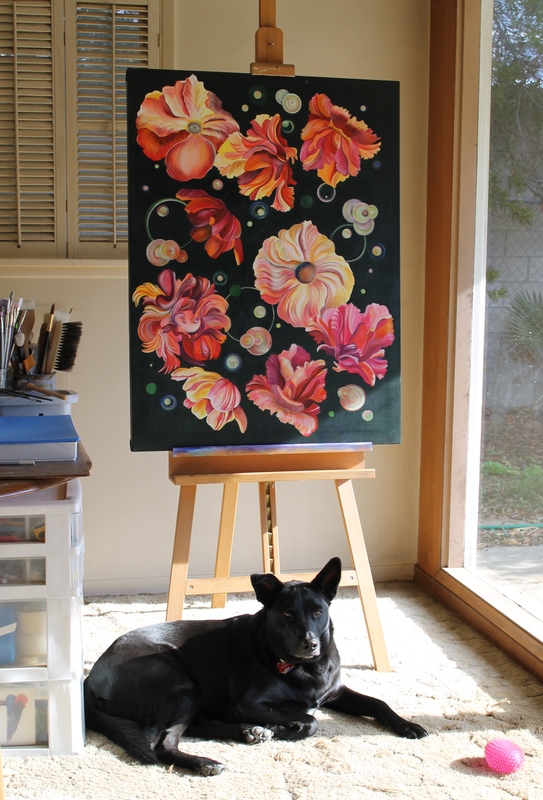 I get feedback from a very knowledgable man and our dog keeps me from taking my painting too seriously. Where do you do your best work? I’d love to hear, please leave your comments. 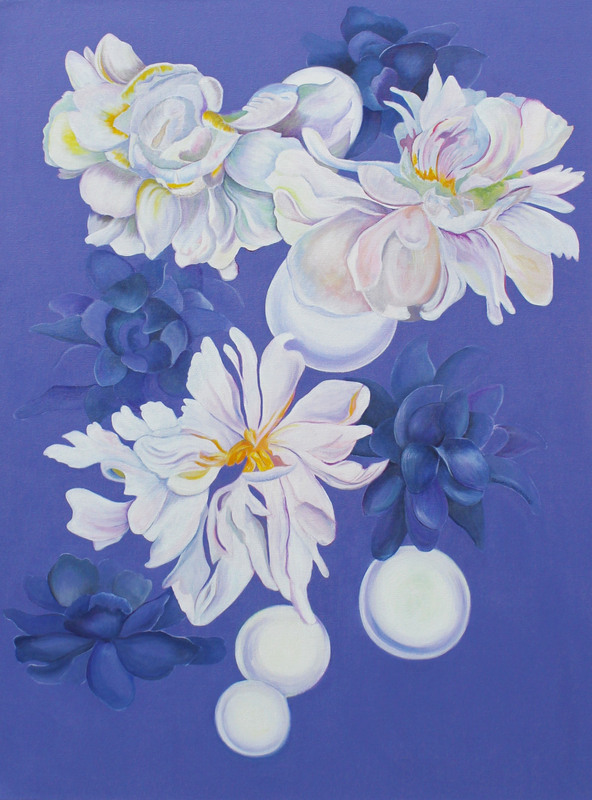 This entry was posted in Visual Artist, Painter and tagged Acrylic Painting, Floral, Flowers, https://www.etsy.com/shop/PamelaAtkinsonArt, Painter, Pam Atkinson, Pamela Atkinson, pamelaatkinson.net, pamelaatkinsonart.net, Studio space, Visual Artist on January 6, 2015 by Pamela Atkinson. I’m a paint snob! I only like quality brands and Golden is the only acrylic paint I use. Their fluid acrylics are the best and I can’t do without the Acrylic Glazing Liquid. Depending on the look I want: I paint it on the canvas before I add color, I mix it into the pigment to make it more transparent or to create a glaze, and I use it on top of the paint to blend it. These paints are easy to use and create consistent results and I recommend them to my adult students. Going to the art supply store is one of the fun things we do on the weekend. It’s a toy store for artists but because my favorite store is 50 miles away, I make sure that my inventory of both acrylic paint and watercolor doesn’t get low. I don’t need paint but Golden has a new line of watercolors called QOR, and I couldn’t resist! I purchased the High Chroma Set of 6 colors which contained Green Gold, Quinacridone Gold, Transparent Pyrrole Orange, Cobalt Teal, Dioxazine Purple and Quinacridone Magenta, in 5 ml tubes. The advertising copy says they are “amazingly brilliant” and its true! I’ve used most of the major brands of watercolors and these react in a different way and the colors glow! For my basic palette, my favorite brand is DaVinci, the paint is high quality and the tubes are large, 37mL, and like Golden, they have always been helpful when I’ve had questions about a product. Lately, I’ve been using Daniel Smith Watercolors because of all their unusual colors. I’m an artist who prefers to use 5 tubes of paint or less in a painting, so it’s fun to add in colors like Indanthrone Blue and Perylene Maroon. Most quality brands of paint handle in a similar way, but QOR moves differently on the paper. Gum Arabic is the binder for watercolors but QOR uses a unique product. There is a nice introductory video on the QOR site that explains the difference. I needed to make a couple of adjustments to my technique to get the colors to flow one into another without hard edges. With the QOR colors it took more effort to accomplish the fluid look I want, but once I got used to the way it applied I didn’t have a problem. Watercolors come in transparent, opaque, and granulating which look uneven on the surface of the paper, these qualities give a painting its character. I didn’t use any granulating pigments in the painting below, but the Cobalt Teal (included in the set) is granulating and Semi-Opaque. All the pigments I used were transparent, except Dioxazine Purple, which is semitransparent. The colors are bright and clear and mix well with each other and they all have a similar intensity which gives the painting a contemporary look. 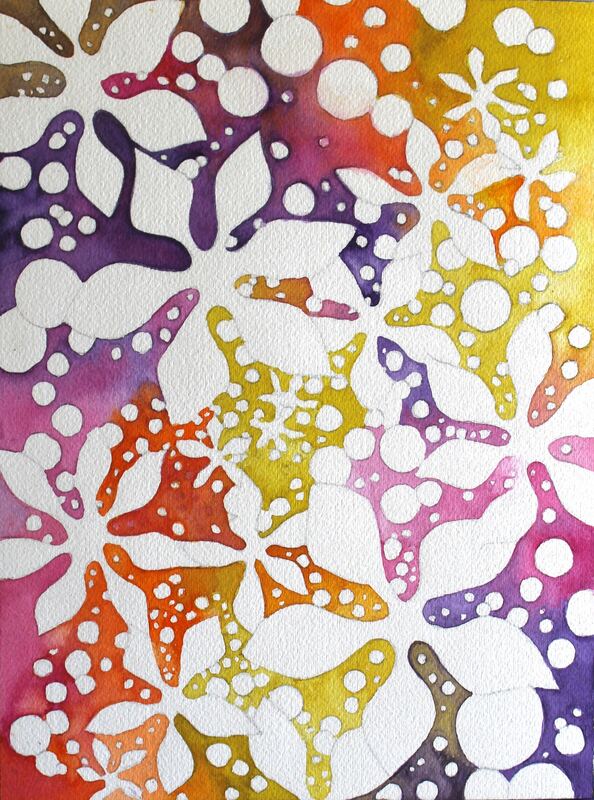 Pamela Atkinson, “All the Stars int the Universe”, Watercolor, 9″ x 12″, © 2015, Print available in Pamela’s Etsy shop. I’m looking forward to trying some of the other QOR colors. I like the clean, bright quality of the paint. But I need to remember, that I don’t need any more paint! What’s your favorite paint? Have you tried QOR? What do you think? This entry was posted in Visual Artist, Painter and tagged Abstract, acrylic paint, Acrylic Painting, Cobalt Teal, Color Mixing, Da Vinci Watercolors, Daniel Smith Watercolors, Dioxazine Purple, Energy, femininity, Floral, Flowers, Green Gold, https://www.etsy.com/shop/PamelaAtkinsonArt, Painter, Painting, Paints, Pam Atkinson, Pamela Atkinson, QOR, quality brands, Quinacridone Gold, Quinacridone Magenta, Transparent Pyrrole Orange, Vibrant, Visual Artist, Watercolor on November 24, 2014 by Pamela Atkinson. For the last few years, I’ve been teaching art at two different schools. Getting to know the kids over a period of time has its advantages. I appreciate Sally’s beautiful line drawings and Thunder’s colorful and bold designs and it’s easy to guide students to a deeper understanding of art making when you know them and how they approach an assignment. I’m delighted to see all the kid’s skills develop and that moment, around the 4th grade when those who were struggling to understand observational drawing finally grasp how it works, makes me as happy as it does them. Most of my students apply what I teach them and build on previous lessons, and because of this, their artwork is confident and inventive. This year, I’ve added a new school to the mix. One of my teaching partners, Sofia Atmatzidou-Eulgem and I are creating an art program for 230 students grades Kindergarten through 8th. Pamela Atkinson, Set of “Moon Moss” prints, digital prints of original watercolors, each image measures 7″ x 9″. Original watercolors and prints available in Pamela’s Etsy shop. What gets your creativity flowing? For me, it might be the weather. I’m a California girl by choice, not birth. Originally from Illinois, I came here after hearing talk of not one more snowy winter! My parents had had it! Since I was a child, I had no say in the matter and off we went to sunnier climes. But I’ve always felt the loss of the seasons; flowers blooming, leaves falling, and even the snow (or the romantic idea of snow). A feeling that the passage of time means something more than people changing the strings of holiday lights around their houses from pumpkins to icicles. Now, in the ever sunny and hot environment in which we live, I long for a change that doesn’t come. Yes, it gets cooler but not cool enough. And so, every year, I strain to feel the crispness of autumn in the air and watch for the pattern of the light to change. It signifies for me a chance to dig deeper into myself and create. What sparks or inhibits your creative output? I’d love to hear your thoughts and comments. This entry was posted in Visual Artist, Painter and tagged Abstract, Acrylic Painting, Color Mixing, Floral, Flowers, Four Seasons, Moon Moss Set, Painter, Painting, Pam Atkinson, Visual Artist, Watercolor, Weather on September 25, 2014 by Pamela Atkinson.